NLS partnered with the Oatey Company, Dearborn, to develop ADA compliant Cover Trap Design. 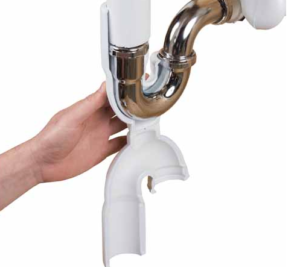 This design protects wheelchair users from the dangers of under sink surfaces and prevents the user from burns, scrapes, scratches and other injuries caused by the plumbing. Once we had a great design, we wanted to develop a small batch of prototype parts for testing. Our 3D printing technology allowed us to print the molds out of ABS plastic and use them to create silicone foam parts. This was a low cost prototype method that allowed us to develop and test several closure methods without the high cost of product tooling. Compared with competitors our ADA compliant cover design is much more efficient with an installation time that is 33% faster than other designs. Not only is our design faster to install but it’s also easy to install using a 180 degree opening that makes installation simple, and by using EVA foam material, the only tool needed to cut the material is a pair of scissors. Although performance is a main concern we made sure to create a product that is not only efficient but also aesthetically pleasing. Unlike most cover trap designs, ours does not require any secondary fasteners such as duck tape and zip ties. Our design also keeps the shape of the lavatory tubular for a neat and clean design. Speaking of neat and clean design, by using the easy to clean EVA foam material, yellowing over time isn’t a concern for the product so it will maintain its sharp white color. Not only will the product maintain its shape and color, but it is also designed to stay in place and not fall off over time as well. 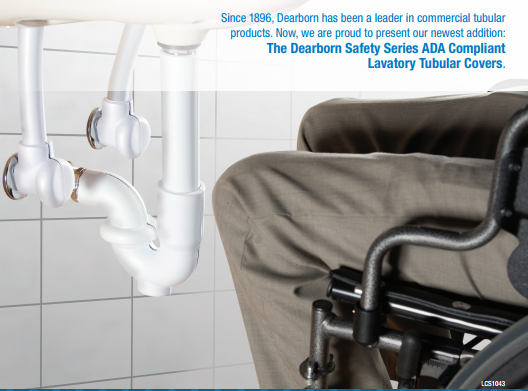 Overall working with Dearborn was a huge success and we would love to work with them again in the future to continue improving the plumbing industry. For more information on this product or if you are interested in ordering it, you can visit Dearborn’s website here.